This service provides an efficient means of introduction foreign DNA, usually plasmid or BAC derived fusion genes, or RNA and ribonucleoproteins into the mouse genome. This service provides an efficient means of introduction foreign DNA, RNA, and ribonucleoproteins into the mouse genome. DNA or RNA is microinjected into the pronucleus or cytoplasm of 0.5 day fertilized mouse embryos. Surviving embryos are transferred to the oviduct of a pseudopregnant recipient and the animals are housed under the protocol number of the investigator but husbandry is provided by the VGER and DAC. The gestation period of the mouse is 19 to 21 days. Pups are born, and will be weaned, tailed and numbered by core personnel at 3-4 weeks of age. The investigator will need to perform DNA isolation and analyze the DNA by PCR or Southern blotting to identify transgenic founders. Several factors influence the production of transgenic mice. Of utmost importance for successful outcome is the quality and size of the DNA injected, thus no guarantee is made by the Vanderbilt Genome Editing Resource for the number of transgenic mice produced. However, provided that the DNA has been prepared in the recommended manner, our records indicate that 10 to 20% of the pups born will usually carry the transgene. The following data may be useful in estimating the number of injection days required to generate transgenic founders. Typically, ~100 embryos are injected per "injection day". PI submits frozen DNA and appropriate service form to VGER for microinjection. Service forms are reviewed and approved by the Co-Directors of the facility, DNA is quantitated, quality controlled, and diluted by VGER staff. Injections are scheduled, mice are ordered. Injections are performed, surviving embryos are transferred to pseudopregnant females. Pups born 19 to 20 days post injection. Pups weaned, tailed and ear punched by VGER staff at 3 weeks of age. PI identifies transgenic founders from tail DNA using PCR or Southern blotting. 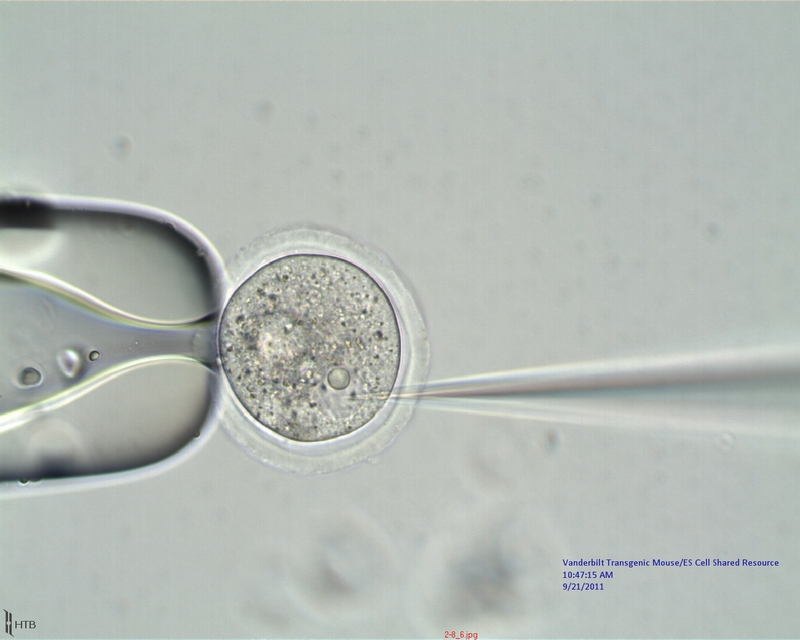 Pronuclear DNA injection video with BAC DNA and SJL/J embryos.